Anytime that you venture out into Nature there is a chance that you will run into some sort of difficulty. Getting lost, hurt or stranded can happen quickly and unexpectedly. I have heard that Nature is cruel. Nature is not cruel, it just doesn’t have an opinion. You can live or die. It really doesn’t care. So when enjoying all of it’s benefits, be ready for the challenges. Be sure to scroll down to see the medicinal uses of plants. Survival starts before you ever leave the house. Making sure someone knows where you are going and when you should be back is very important for obvious reasons. Now days, having a functional cell phone with you can be a life saver, assuming you are somewhere that has coverage. Assessing your destination, the activity you intend to participate in and how long you will be gone should give you a good idea of what you will need to take. You should however, make sure you have basic survival tools even on small trips. Basics can vary depending on your particular needs. For instance, if you are allergic to bee stings, do not go into woods or fields with flowering plants, without your epipen. 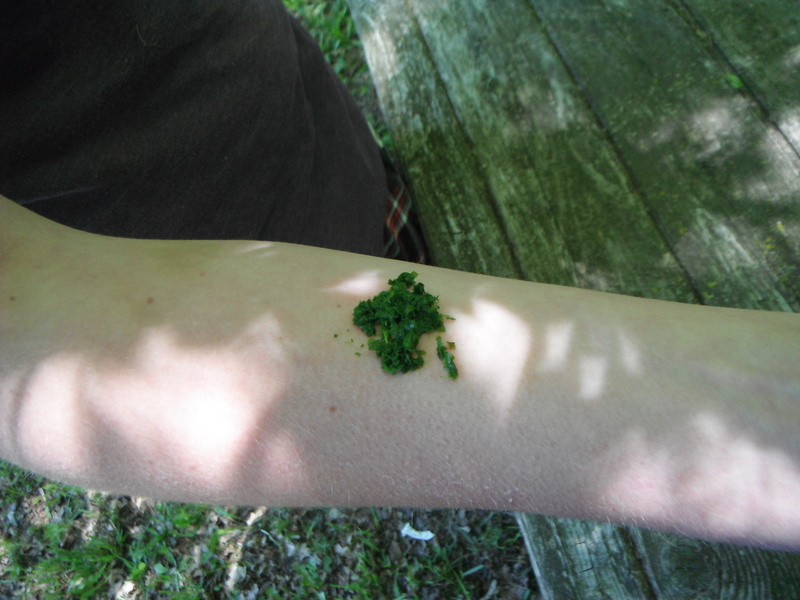 If you are allergic to poison ivy and you are going foraging, make sure you are wearing long pants, shirt and gloves. If the sun is bright and shiny, a hat that covers your head is important, especially if you are balding or have a buzz cut. I love my goofy cowboy hat. Warm in cold weather, keeps the sweat off in hot weather and it keeps the sun off my ears, which are sensitive to ultraviolet rays. 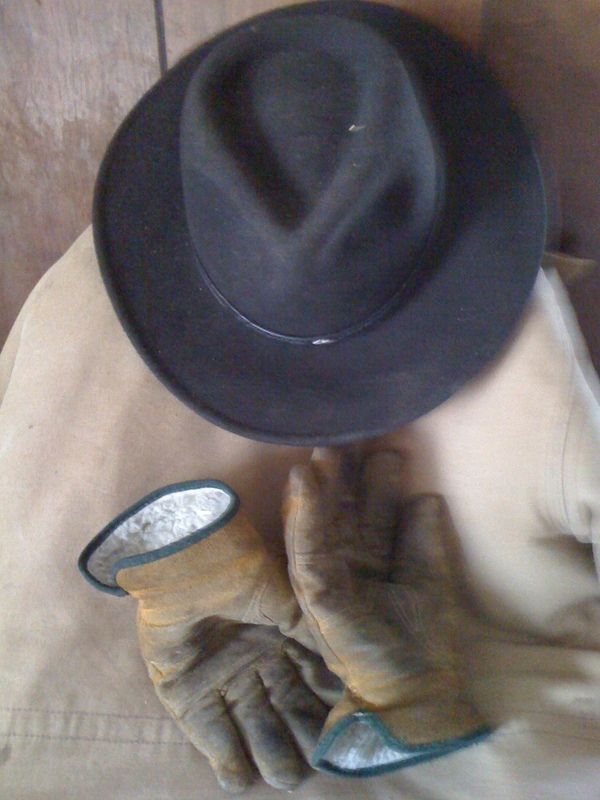 Here is the hat I wear. Always make sure you have a good source of drinking water. Dehydration is a serious issue. A strong knife with a full tang. A good knife is indispensable in a survival situation. Wooden matches are nice, but a striker and magnesium is way better. It works wet and for a long, long time. A zip bag of tinder material. String, a small pack of hoouhks and fishing line. A small 1st aid kit. A signal whistle and a signal mirror. A Wrist Rocket type slingshot with ball bearing ammo stored in handle. 12 x 12 light plastic tarp. Believe it or not, this will all fit in a fairly small backpack. If you get lost in the deep woods the most important thing to do is keep calm. Keep your head about you. Take a seat and a breath. Look around to access your situation. Will anyone miss you? If so, consider improving your situation where you are at if it is likely a rescue will be sent. Build a fire. What is the weather like? Will you need a shelter? If you are going to have to spend the night, remember your poncho and heat blanket. Remember your heat blanket would go closest to you. The poncho over that. If the weather looks inclement, make a wind break. There is nothing more miserable than a cold wind. Hopefully your poncho will keep you dry. Warm and dry will be key. If you decide it would be better to walk out, try to do so in light. It’s easy to get hurt trying to walk through the woods in the dark. Remember your compass. If you have no idea what direction to go in, pick a direction. You should have taken note what direction you entered the woods from your vehicle. If you entered going South, then pick North. Remember where a major highway was. How about a town or a road. Any thing that can give you an educated guess as to the best direction to pick. If you didn’t take note, again pick one. Whatever direction you pick, say East, stick with it, travel East. Don’t give up on it unless you hit an un-passable obstacle. There are few places anymore that if you travel in one direction, that you won’t hit something that will lead you to civilization. If you hit a stream, follow the current. It will lead you to a larger body of water. People tend to live near water. If it hits a river, follow it downstream as well. If you hit a vehicle trail, check for fresh vehicle tracks. Either way, its a sign of civilization and it should be easy walking. Stick to the trail. Remember to hydrate. Whenever you get the chance, pull out your filter straw. Make sure you have a decent one that filters sediment and microbes. Eat your energy bars but don’t hog them down. Eat them slowly taking a bite every so often. Refer to the foraging page of this site. Depending on the time of year you will find various edibles. Nibble on them as you find them. You won’t starve to death. That takes some doing. Dehydration is a bigger concern. Let’s say you drove off the beaten path in the Upper Peninsula of Michigan. You are 10 miles from nowhere. This is going to take a while. Now it is time to consider more serious foraging and possibly hunting and trapping. In your pack you have hooks and fish line. If you are near a stream or other body of water, make a pole and fish. Dig up a worm or tear a old log apart for grubs. Not all streams in Michigan have trout but most have some sort of fish in it. 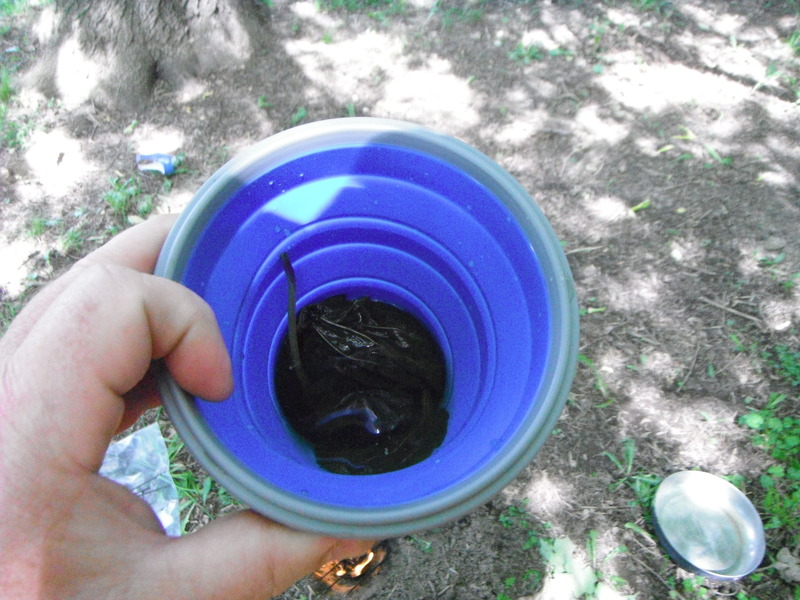 Even if you catch a chub or shiner, its protein. Can’t be choosy now. 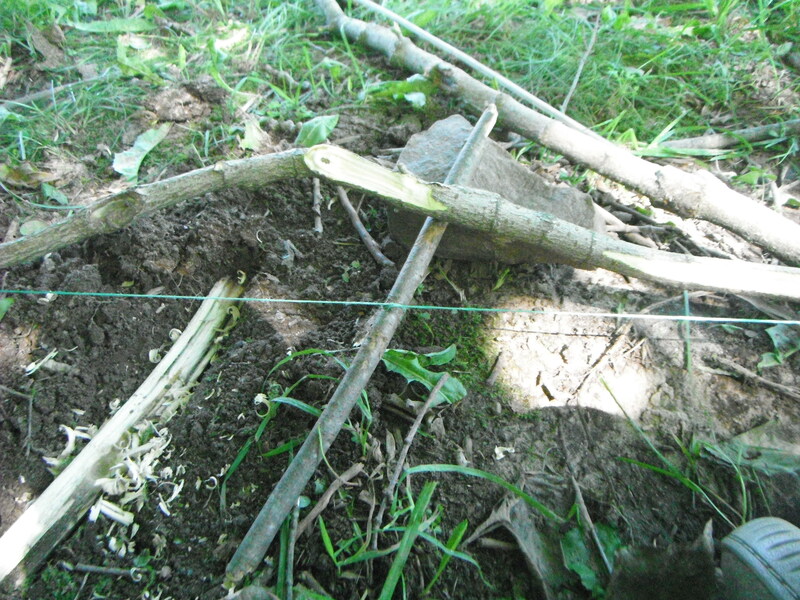 Set a snare for chipmunks, squirrels, rabbits or birds. The slingshot can easily kill any of those animals. The bottom line is, be prepared with a survival pack. Don’t panic, access your situation. Decide on a course of action and follow it through. Chances are better than good that the experience will end up teaching you something. The next time you go out in the woods, you will be better prepared for whatever happens. Always remember that God built you to be able to survive tremendous hardships, but he also put many things in nature to help you survive it. Ask the Lord for wisdom and the strength to find your way to safety. He has your back. There are many plants that American Indians used to treat a myriad of ailments. Also there are many modern treatments and cures that derive from these plants as well. Though most modern medicines are synthesized and not from harvested plants, their origin was from the plant. 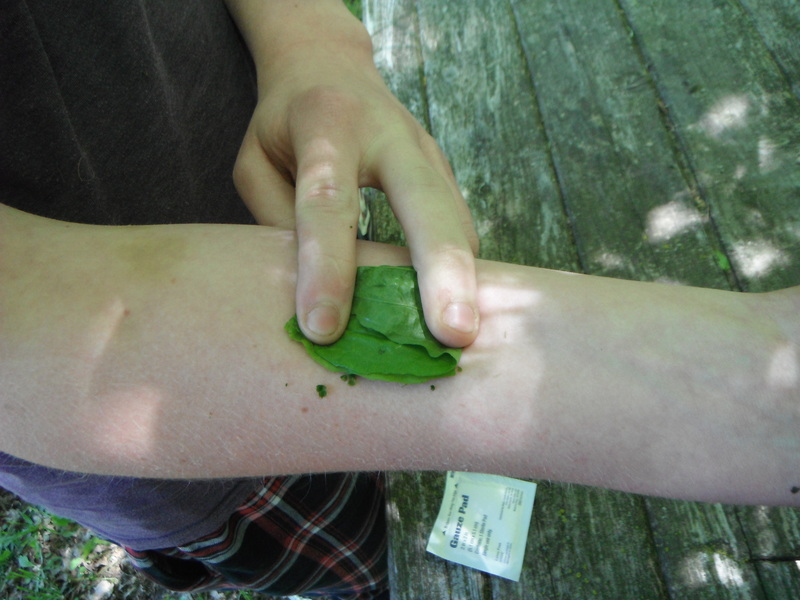 Above is a demonstration of using Plantain as a poultice and skin. Plantain is excellent for stopping wounds from bleeding. To make the poultice, use clean water to wash and then pulverize the leaf. Some people chew the leaf, but unless you have a germ free mouth (not going to happen) I would rather not. See more on the Plantain in the Edibles page. The Plantain is a plant you need to know. “Plantain is edible and medicinal, the young leaves are edible raw in salad or cooked as a pot herb, they are very rich in vitamin B 1 and riboflavin. The herb has a long history of use as an alternative medicine dating back to ancient times. Being used as a panacea (medicinal for everything) in some cultures, one American Indian name for the plant translates to “life medicine.” Recent research indicates that this name may not be far from true! The chemical analysis of (Plantago Major) reveals the remarkable glycoside Aucubin. Acubin has been reported in the Journal Of Toxicology as a powerful anti-toxin. There are many more highly effective constituents in this plant including Ascorbic-acid, Apigenin, Baicalein, Benzoic-acid, Chlorogenic-acid, Citric-acid, Ferulic-acid, Oleanolic-acid, Salicylic-acid, and Ursolic-acid. The leaves and the seed are medicinal used as an antibacterial, antidote, astringent, anti-inflammatory, antiseptic, anti-tussive, cardiac, demulcent, diuretic, expectorant, haemostatic, laxative, ophthalmic, poultice, refrigerant, and vermifuge. Medical evidence exists to confirm uses as an alternative medicine for asthma, emphysema, bladder problems, bronchitis, fever, hypertension, rheumatism and blood sugar control. A decoction of the roots is used in the treatment of a wide range of complaints including diarrhea, dysentery, gastritis, peptic ulcers, irritable bowel syndrome, hemorrhage, hemorrhoids, cystitis, bronchitis, catarrh, sinusitis, coughs, asthma and hay fever. It also causes a natural aversion to tobacco and is currently being used in stop smoking preparations. Extracts of the plant have antibacterial activity, it is a safe and effective treatment for bleeding, it quickly stops blood flow and encourages the repair of damaged tissue. The heated leaves are used as a wet dressing for wounds, skin inflammations, malignant ulcers, cuts, stings and swellings and said to promote healing without scars. 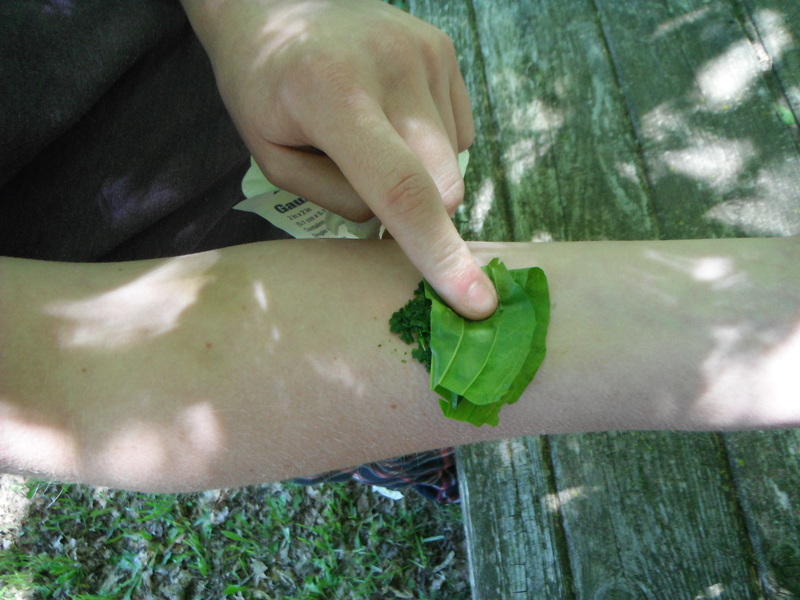 Poultice of hot leaves is bound onto cuts and wounds to draw out thorns, splinters and inflammation. 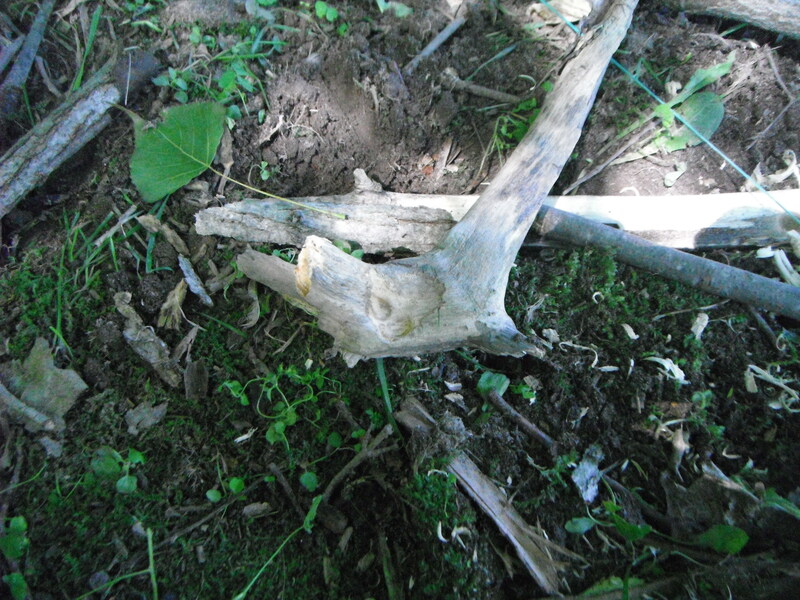 The root is said to be used as an antivenom for rattlesnakes bites. Plantain seeds contain up to 30% mucilage which swells in the gut, acting as a bulk laxative and soothing irritated membranes. The seeds are used in the treatment of parasitic worms. A distilled water made from the plant makes an excellent eye lotion.” (http://altnature.com/) With that information, I would say if you learn to identify one plant and its capabilities, you would be hard pressed to find a better one. My wife recently had the misfortune of having two teeth pulled. The bleeding would not stop. She was concerned with going to sleep with a mouthful of gauze or to let the bleeding continue without it. 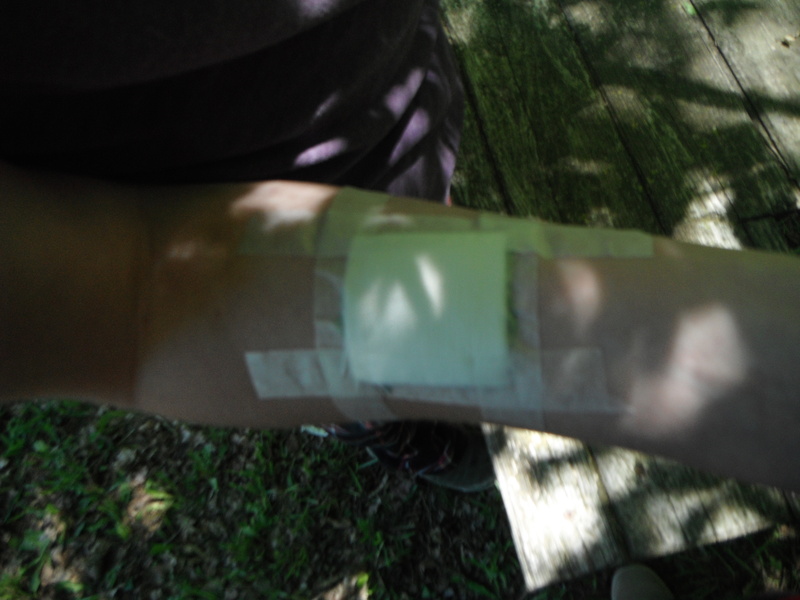 I had her pack the area with chopped and bruised plantain leaf held in place with the gauze. After 45 minutes the bleeding had all but stopped. My wife was able to get some sleep that night. Keep in mind that it is just as important to be 100% accurate when identifying a plant being used for medicine as it is if you were going to eat the plant. Do not settle for the information that I provide. Verify this information on your own. What you apply to your body internally or externally is your responsibility. I do not claim to be a trained homeopathic practitioner or herbalist. I am someone who has spent way to many hours to count in Nature and I have spent a ton of hours researching these plants uses. I recommend that you pick out the plants that you are very confident that you can find and identify. Then do your own research on those plants. Antihemorrhagics (blood clotting)-used to clot the blood to stop bleeding. Some may be for internal bleeding as well as external. This condition is probably the most likely cause of issues when is a survival situation. Get to know these plants well. Wild White Yarrow may be the best. 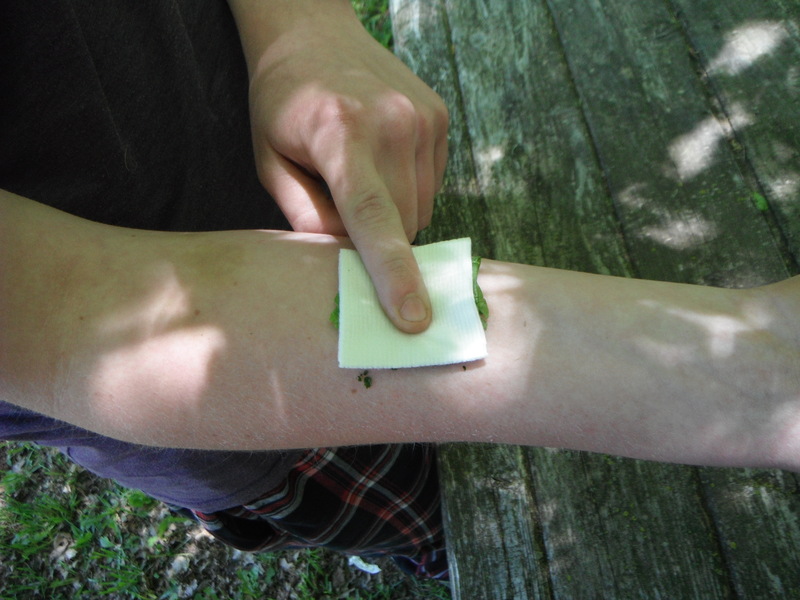 Use as a poultice (a moistened mass of plant material) applied to the wound held in place by a bandage. Puffball Mushrooms and Plantain Leaves are also effective poultices used to stop bleeding. Pain Relievers for aches and sprains. 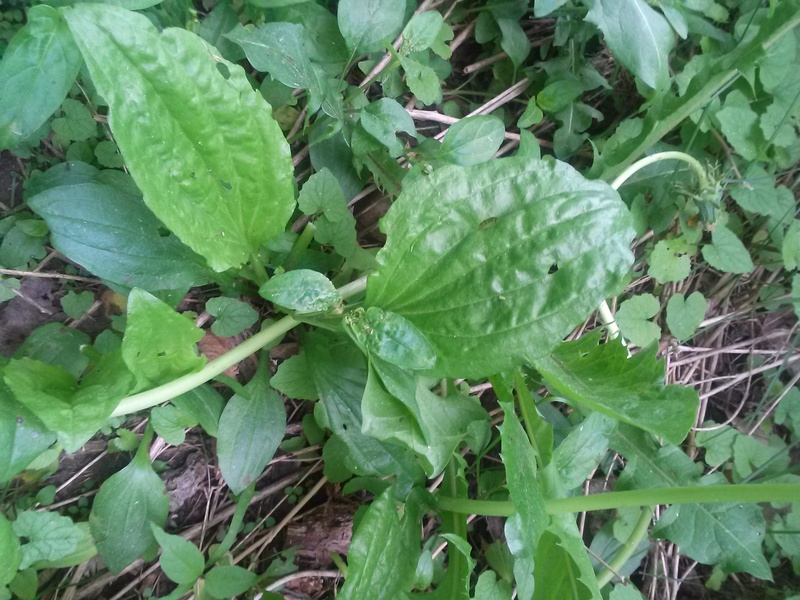 Apply poultice of Curly Dock, Plantain, Sorrel, Wild Garlic or Chickweed. You can also make effective salves using the juices mixed in with Petroleum Jelly (from your Survival Pack). Headaches – Make a tea of Wintergreen or Violet leaves. Cold or Sore Throat – Make a tea from Burdock Root, Mallow or Mullein leaves and roots or Mint leaves. Gas and Cramps-Make a tea from Mint leaves. Diarrhea – Make a tea from the roots of Blackberry plants. Congestion – Mullein is an effective expectorant. Use it as a tea. Some people even smoke it. It is said it is not harmful to smoke. The American Indians did use it as a tobacco. Insect Repellent – Decoction from any plant in the Alum Family such as Wild Onion or Wild Garlic and Wild Ginger works as well. Burning the fluffy tufts from Cattails in your campfire also works very well. There is way more information on Plants and their medicinal uses. I tried to provide you with ones that you should be able to find in Michigan and the Great Lakes area. If you remember these, you will be able to take care of most issues that you would commonly run across. See the wild edible page for pictures of these plants. If they aren’t there yet, they will be. How to make a Ground Stove? 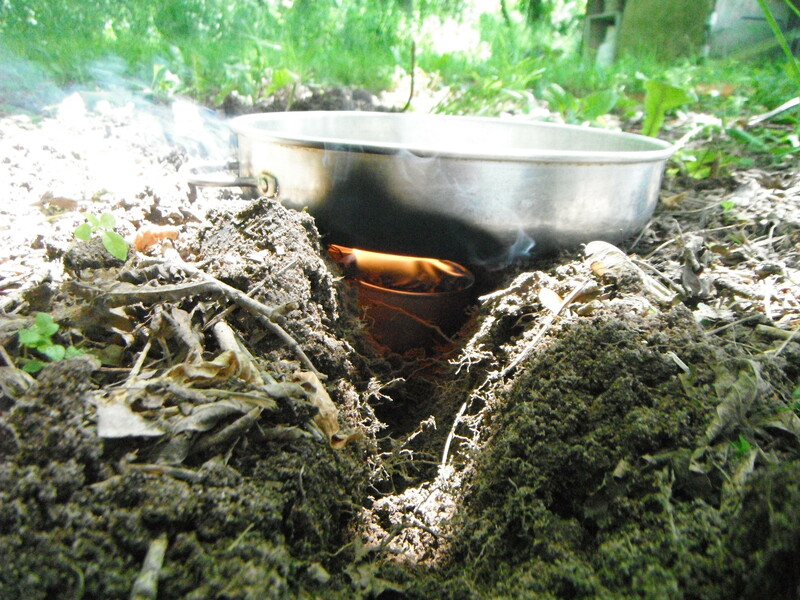 Ground Hole Stove can provide an efficient means to cook your food during a survival situation. Notice the trench allows air flow while not allowing much light to escape. I did’t make much for this demo. The plants I used were Plantain, Dandelion and Creeping Charlie. A Ground Stove can be a very valuable asset in your survival tool kit. Being able to cook the food that you find when in a survival situation benefits you in several ways. First and foremost it sanitizes the food. It will kill any bacteria or viruses that may be on or in the food. Second, Cooking the food creates a broth or tea. In doing so, the water used is also sanitized. Drinking the broth or tea allows your body to capture the nutrients that was lost while cooking. It also accomplishes adding valuable water to your system as well. Thirdly, it gives you a sense of well being. Taking the time to cook your food slows you down a bit. It gives you a moment to pause. This is very important in a survival situation. A clear mind is a more efficient mind. This can prevent mistakes and injuries. 6 Pieces of light metal rod-10″ long. The heat source can be a small wood fire that you can continue to feed, a can of Sterno or a Buddy Stove (buddy stoves burn very dirty). If you can use wood to build a small fire, that would be best. The reason is, is that you will not be using your un-replaceable resources. The cans of Sterno are awesome. The only issues that I have with them is that you have to to carry them in your pack. They aren’t heavy, but you can only carry so many. Once they are gone, they are gone. Refer to the wood resource and use it when you can. Third is the Buddy Stove. If you were in Cub or Boy Scouts, you probably made one. Using a cat food or tuna tin, tightly coil corrugated cardboard and place in tin so that it fits to the top of the can. Use small pieces of cardboard to stuff empty spaces. Melt in plain wax and let set. That’s it. One issue that I have with a Buddy Stove is that you can carry only so many as in the Sterno, but the main issue is that they burn very dirty. Black soot will get on anything the flame touches. You definitely must burn it in the open air. Do not attempt to burn it in a shelter. I caution you from burning anything in an enclosed shelter unless you have proper ventilation. 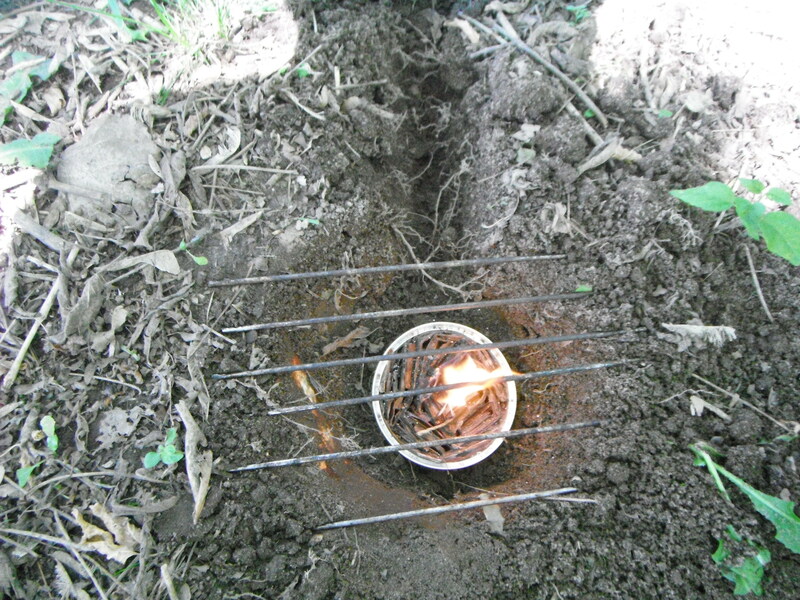 To make the ground stove, use whatever tool you have, such as your knife, to dig a hole in the ground. Make the hole deep enough to recess the stove an inch to two inches below ground level. Make the hole large enough to be able to place your heat source in the hole with some space for air around it. Don’t make it so large that your metal rods can’t span the space. From the hole, dig a trench that matches the depth, about 8″ long and is an inch or so wide. This trench is to allow air flow into the fuel. Place the rods across the span over the fuel. The rod allows you flexibility to move your pan around to the most efficient place over the heat. The pan should be an aluminum pan. Large enough to hold sufficient amounts of food for a meal and light enough to be easily packed. This sounds like a bit of work when you can just build a fire and throw the pan on top. You can. But going through this process does a few things. One, it gives you a task which can ease your mind. Two, it gives your heat source shelter from the wind. Third, it gives you more control over your cooking. Something else to consider is this. If you are in a situation that you don’t want to be seen, I.E, escape and evasion (in today’s world, who can speculate why) using this method hides the vast majority of the light coming from the heat source. Note the recess in the wood I use as my palm piece. Building a Fire might be the single most important skill that you can have. Most people can figure out a way to get out of the wind and rain. If you have your poncho from your survival pack or the tarp that you attached to it, you have your wind and rain break. But, building a fire takes some practice. There are several fire starting aids that you should have in your pack. Tinder made from dryer lint or cotton balls at a minimum should be in your pack. Also a store-bought long burning fire starting stick. There are several products on the market that work well. You should also have your matches and your Ferrocerium fire starting rod and striker. Having a lighter on hand is a good idea as well. Having all these fine items on hand is awesome. If you prepared you have it made. Right. Potentially you do. But, you still need to do things right. Make sure the spot you chose to build your fire is out of the wind. I like putting the fire just on the downwind side of my Lean-To yet still under the roof. This keeps most of the smoke out of my shelter, but it allows the heat to rise and reflect back into the shelter while allowing the smoke to escape. Make sure you have the proper material already available and within reach. Try to use natural tinder to start your fire when everything is dry. Save your survival pack material for when its wet. There are a couple of things to look for when gathering material. White Birch bark catches quick and burns even when damp due to the chemicals in its bark. 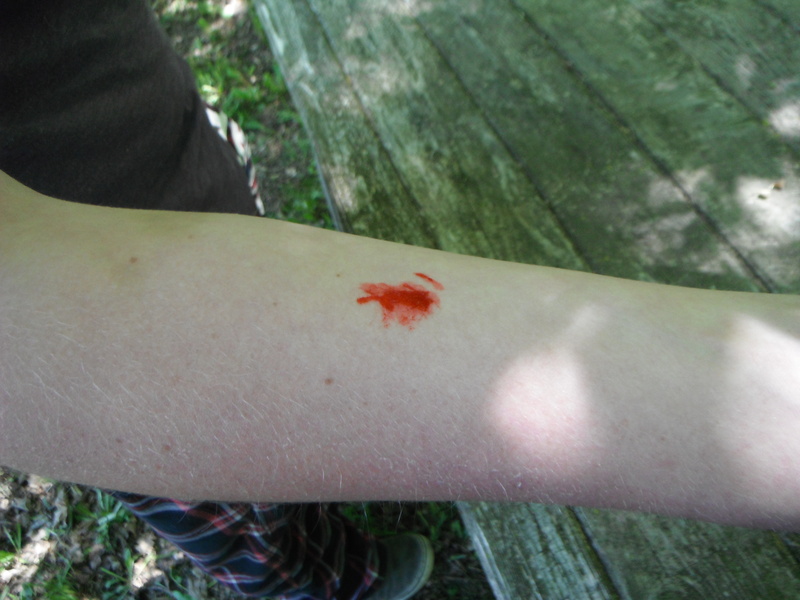 Also look for wounds on pine trees and gather the sap that bled out. You can cut the tree yourself and wait a while for it to bleed. The sap from the pine tree is actually what Turpentine was made out of. It is very sticky and very flammable. Try not to get any on you. Find dead grass or any dry dead material that will quickly ignite. Remember that each stage of your fire has to be hot enough and big enough to catch the next stage on fire. Make sure each stage is completely ignited before adding the next stage on it or you will smother and put out your fire. 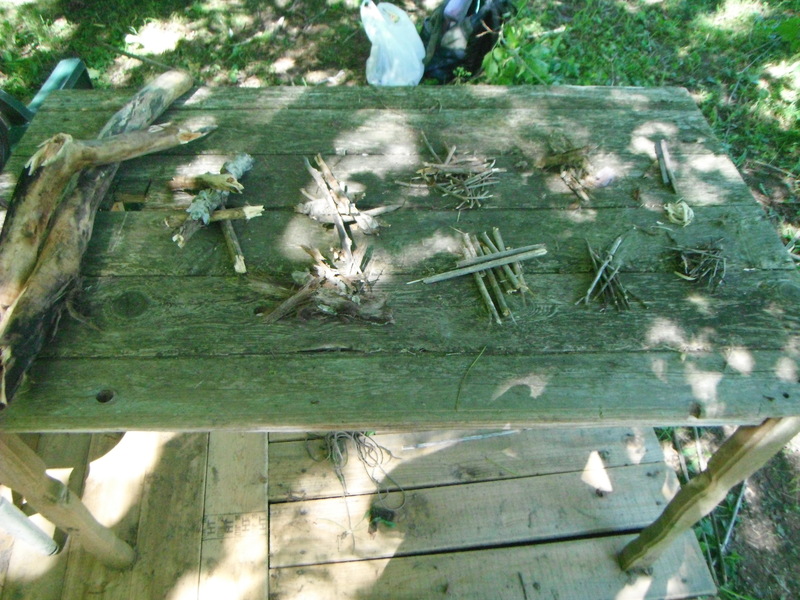 Speaking of Stages, I use a simple six stage process for building a fire that works every time. The importance of following the stages is that it causes you to collect the proper material and have it ready for your fire. The stages are very simple. Stage one is your tinder. 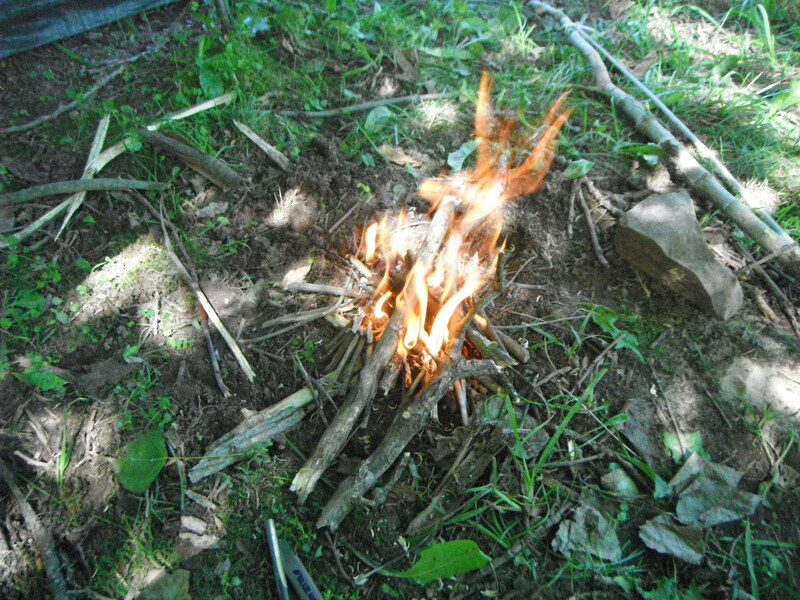 Stage two is easily ignited material such as pine cones, twigs and dry reeds. White Birch bark works great. Then on to your next stage and your next until you get to the point that the threat of your fire going out is exhausted. Whether you have six stages or four is irrelevant. Just know that you need to pre-gather your fire building material and have it ready to graduate your fire to the size you desire. Everything should be from dead material and as dry as possible. If it’s wet you have a whole different ball game. Time to get your fire starting kit from your pack. You still need to gather fuel and have it nearby. Try to find the driest place possible. It may be advantageous to put up a shelter to protect your fire. See shelters below. Hopefully you have a long burning product of some sort. There are many store-bought products available. Check your surroundings for White Birch or Pines and gather the resources from them. Even though it might be raining there is still dry material available. Look under low hanging pine bows or under any natural shelter. Look in downfalls as some of the material may be sheltered and dry. 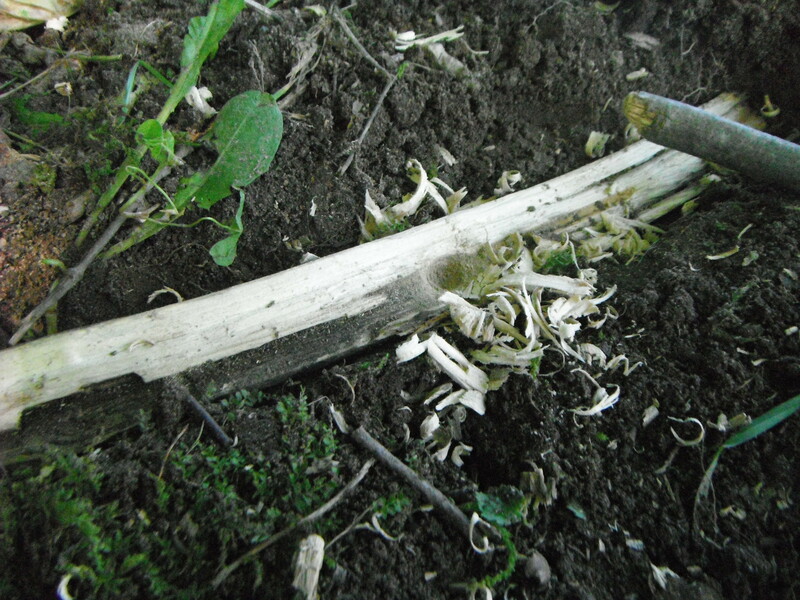 Even wet sticks may still be dry under the surface. Take your knife and whittle into the core to find dry tinder and stage two wood. Start your fire starting stick (or other product). Place the stage two material around the burning fire stick. Once you have the stick surrounded, place some of the material over the top of the stick. It will dry quickly and catch on fire. Do the same with each stage until you have the desired fire. Just don’t throw a bunch of material directly on the fire until the fire is established. Once you have a descent fire going you can place pretty wet, not soaked like a sponge, material around it and spanning the fire. It will dry and ignite pretty well. Now all the fire starting products aside, you need to be able to start a fire even it you have no products at all. Not Rods, no Matches or Lighters. Nothing. Time to start rubbing sticks. Yes it actually works, but speaking of work, it takes a considerable amount of it. Dry material will be crucial. You may have to take a minute to expose dry wood if its wet. Make sure you have a two dry pieces of wood. Large enough to handle the operation. Say three by three at a minimum. Find dead wood. You might need to split a dead log with your knife. Notch both pieces in the center that is large enough to hold the ends of your spinning stick. The photo at right is my palm piece. Note the recess where the spinning stick rest. Gather your tinder around the block that you placed on the ground. I recess this wood into the ground so that it can’t move. The spinning stick should be at least a foot long. It needs to be dry and as hard of wood as possible. such as oak. The blocks should be softer wood, such as pine. The picture on the right shows the recessed piece that the spinning stick sets in. Now you need a flexible stick to use as a bow. Tie a strong string to both ends of the bow stick. Don’t make the bow bend much if any. You don’t want the string too tight. Loop the bow string around the spinning stick so that when you reciprocate the bow, it turns the spinning stick. It may take some adjusting to get the bow and spinning stick working. Once you have it working well. Put one end of the stick into the center notch of the ground block. Make sure your tender surrounds the stick on the block. Then place the top end of the spinning stick into the notch of the hand block. Make sure the bow string is wrapped around the spinning stick. Push and pull the bow making the spinning stick-spin. Make it spin as fast as you can causing friction heat. The heat will start the wood dust, created from the softer block, to ember. Push the stage one tinder in close and blow lightly on the ember to grow it so that the tinder is exposed to the heat and ignites. Once ignited, follow the stage one through stage six guideline as above. It can take a good amount of spinning to create the heat needed. Don’t give up. You should practice this once or twice before you find yourself in the situation that inspires your need to use this method. Now reality check. This is work. It is a real hard way of going about making a fire. You are so much better off making sure you have proper fire starting supplies, that it is difficult for me to drive the point home. Hopefully this helps. Building a fire from friction is akin to swimming from New York to Hawaii in rough seas. Yes, the fact that New York is on the Eastern Seaboard and Hawaii is in the Pacific did not escape me. Get the point? Be prepared instead. The cold snow or ice will lower your body’s core temperature. Your body then has to work harder to maintain its heat. It also tends to use more water to accomplish this task than what you are getting from the snow or ice. This will lead to both hypothermia and dehydration. Rather than eating snow or ice, find a way to liquefy it. Eating snow or ice (or extremely cold water) actually dehydrates you. By lowering your core body temperature, your body needs to metabolize to stay warm. That process actually uses more water that then you gain by eating the snow or ice. Heat it first. Melt it with fire or find a running source of water such as a stream. Heating the stream water is still important to both kill bacteria and to warm your core. Also, make sure your snow or ice are from as clean a source as you can before using it. The Goldenrod Gall Fly Larvae can be found on many Goldenrod plants. Check out the photos. I can’t find any evidence that this grub is harmful to humans and few that briefly state they can be eaten in survival situations. I post them as important to know because they do make great fish bait. You should have small hooks in your pack. Recover the grub as shown. They actually stay on a small hook very well. Small fish like trout, panfish, chubs and shiners love them. I grew up using these grubs because they are readily available and wax worms or mealworms just weren’t easy for me to get to. I caught a lot of bluegills on these grubs through the ice as a kid. Shelter and Heat-If the snow is deep enough, you can dig a snow cave. Be careful not to dig too deep down. Make sure only a couple feet of snow is over you. If it were to cave in on you, you don’t want six feet of snow on you. Snow is a great insulator. Making a tee-pee or lean-to packed with snow makes a very good shelter. Don’t get caught in a situation without your survival pack. Preparation is the first step of survival.